24 Mar Larry Myer. Live music. We love our Iowa singer/songwriters, and here’s another to add to the list. Larry Myer is an energetic singer, songwriter and acoustic performer. He has played more than 200 towns in his homestate of Iowa and more than half the states of America, working his way up from a busking street performer to concert venues around the country. He has released two recordings, the landmark "Flatlands" CD and the followup, "The Ring and Other Ballads". Larry is also a winner of the Branson Songwriting Contest. 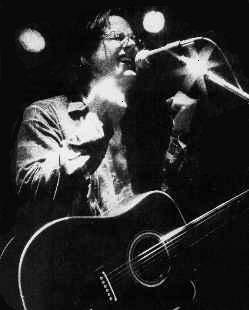 "Myer's voice is the trademark of Iowa's best acoustic rock. His lyrics are gentle yet biting. His voice simultaneously pleads and demands." Welcome Larry Myer to the tasting room on April 8, 2017, 7–10pm.